September, and it’s back to school in Wiveliscombe, home of Brendon Powerwashers. 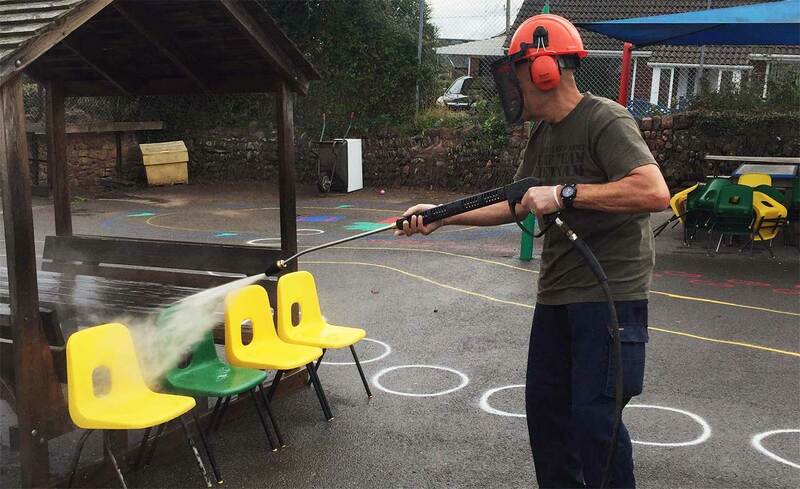 The local primary school needed help with giving the site a good clean, and Brendon Pressure-Washers came to the rescue by lending the school a Model 20KPE – free of charge, with a free delivery and return service. The Pressure-Washer was used to clean chairs and outdoor equipment – showing the versatility of the Model 20KPE in a small-scale operation. This 2000 psi / 140 bar Powerwashers is used, primarily, by the tool hire industry as its flexible pressure from 0-2000 psi delivered at rates from 13 litres a minute makes it an ideal for tool-less aggressive cleaning tasks and is particularly useful in very delicate operations. Like all Brendon Powerwashers products, the machine comes in any colour and is fully equipped with a 10-metre industrial Pressure-Washer hose reel. It is mounted on a wheeled chassis, which makes it fully mobile, and the cat pump is powered by a Honda GX200 Engine. There is a Thermo-sensor valve which keeps the seal of the pump cool whilst the Pressure-Washer is on tick over and not in use, and this valve releases the water which has been heating up around the pump whilst the trigger has been closed during periods when the operator has been involved in a “stop and start” mode of pressure washing. This Brendon Pressure-Washer, the Model 20kpe can be supplied with either a diesel or a petrol engine. It comes complete with a towing attachment which makes it easy to fit your Land-rover, fork-lift truck, or another towing source. It can also be fitted with a forklift facility allowing it to be lifted to “heights above the ground”. So, it is not just for Primary School use – but Brendon Pressure-Washers were more than happy to lend a hand in the “back to school” panic of early September.